Caterpillar Local Host Plant: Axonopus compressus (Poaceae, common names: Wide-leaved Carpet Grass, Cow Grass). 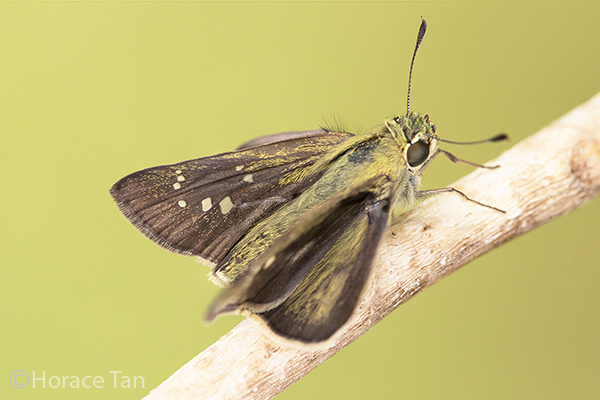 A male Small Branded Swift giving a view of the upperside of its forewing. A close-up view of the forewing upperside, illustrating post-discal spots in spaces 2-4, 6-8, two cell spots and the brand. 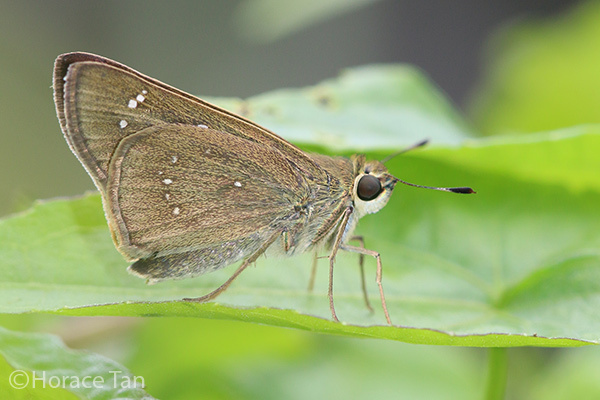 On the upperside, the wings are brown, greenish at the base. There are white post-discal hyaline spots in spaces 2-4, 6-8 and two cell spots in the forewing. 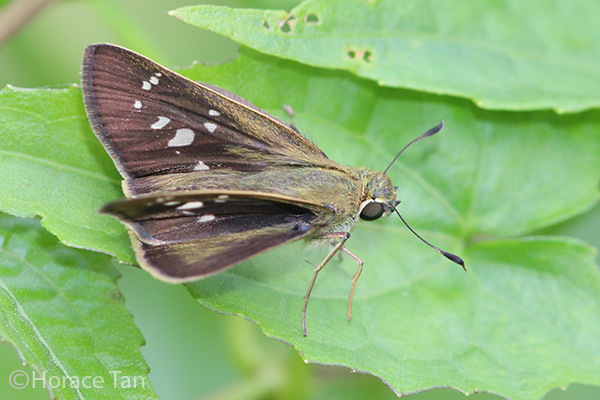 The male has a narrow oblique brand in the forewing running from the spot in space 2 towards the dorsum (the brand is angled in such a way that a line drawn from and through the two cell spots would intersect it). The female has additional white spots in spaces 1b, consisting of one minute upper spot and one larger lower spot. On the underside, the wings are pale brown with a greyish tone. The forewing has the same spots as per the upperside, and the hindwing has a cell spot and post-discal spots in space 2 to 5. The upperside view of a female Small Branded Swift, showing the two additional post-discal spots in space 1b. 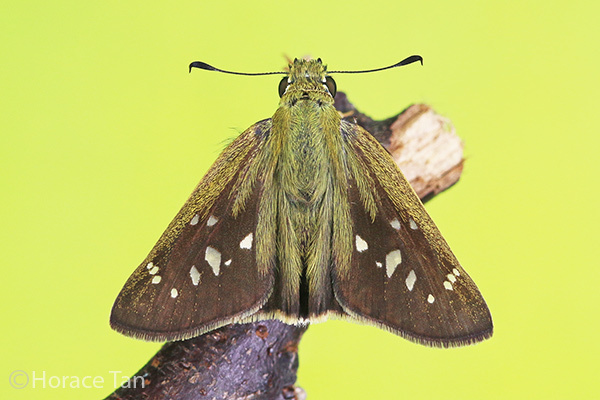 A female Small Branded Swift observed at the forest edge in the nature reserve. The same female Small Branded Swift in the above picture partially opens its wing to sun-bathe. The Small Branded Swift is common in Singapore. The adults have been sighted in multiple locations including nature reserves, wastelands, urban parks and gardens across the island. The adults fly with a swift, strong and darting flight. 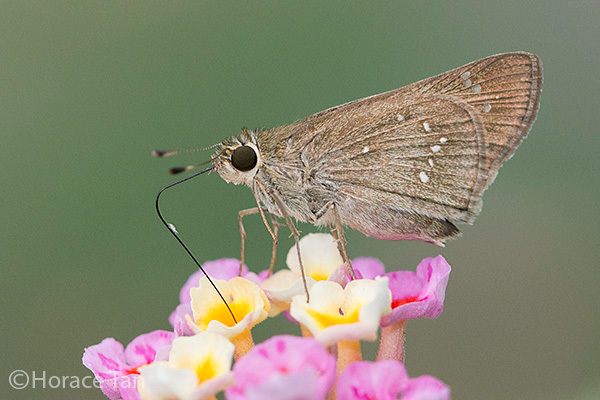 They have been observed to sunbathe with open wings in sunny condition, visiting flowers and puddling on wet grounds.